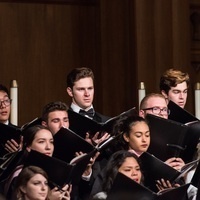 The combined LMU Choruses, joined by a professional orchestra, present the Duruflé Requiem and Vaughan Williams’ Toward the Unknown Region in preview of their Summer 2019 concert tour in London and Paris. The concert will be director Mary Breden’s final concert at LMU. Tickets at cfa.lmu.edu/tickets: General public $20 (front nave) and $15 (rear nave); faculty, students, senior citizens $18 and $12; LMU students with ID $5. Reserved seating.